There is supposed to be a way to trigger a Jenkins job via GitlabCi, using the respective plugin. FWIW, the trigger you referenced originates from Gitlab repository events, not from a GitlabCI execution. The only possibility (that crosses my mind) of triggering a jenkins job from inside a GitlabCI execution is by having a (custom?) script invoked as part of the GitlabCI execution which remotely activates a Parameterized Trigger Plugin configured for your jenkins job, via a properly-crafted POST request which would include the desired parameters. Here's the way I do it: no plugin required, just triggering Jenkins api from gitlab-ci. I will assume you have a gitlab-ci runner installed and configured. That is the rough structure. That script will merely trigger a Jenkins job and forget about it. You need to work a little more to monitor the job and feed its status back in Gitlab-CI, manage security and possibly get some commit info from gitlab to inject into your job. In order to have a proper monitoring, I recommand to write a full trigger + monitor + return value script [** ] (in whatever language available or you're familiar with). Just start by triggering the job as I stated above. until the result of this command is not 0. Finally you may curl once more on JENKINS_JOB_URL/lastBuild/api/json but this time you grep it on UNSTABLE, SUCCESS or FAILURE. By following the guidelines above, you can fully orchestrate Jenkins jobs from Gitlab-CI. I've posted a long discussion on why and when should you do this. [** ] Of course I mean by that to craft a script nicely with params, functions, nice variable names, meaningful logs... You name it. If you want to keep it simple, try the generic webhook trigger plugin. You can trigger a build by sending an http POST using a JSON body or URL parameters. Now you can use it in your pipeline assuming you had a deploy function. I must agree with @Tensibai. Two CI/CD systems on the surface does seem overly complex. You might want to consider sticking with one if possible. Not the answer you're looking for? Browse other questions tagged jenkins continuous-integration gitlab or ask your own question. 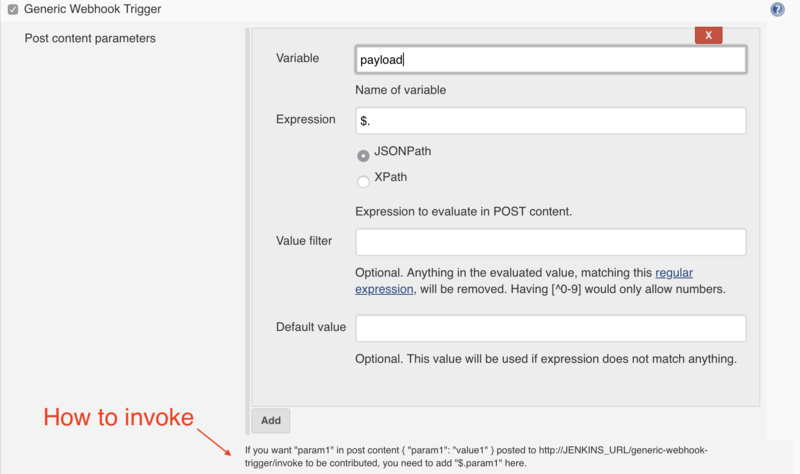 How to trigger Jenkins job by deploying git pipline using webhook?